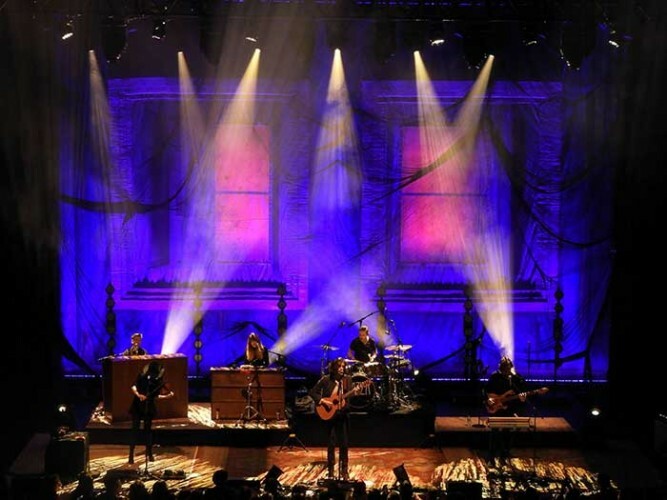 UK – Rental and production specialist Adlib continued its excellent working relationship with the highly acclaimed, hugely popular and multi-talented Irish singer-songwriter and musician Hozier, and the equally skilled and accomplished production team led by ‘Duchess’ (Sue Iredale). The Liverpool-based company supplied sound and lighting equipment plus crew for the band’s recent UK and European tour, with a CODA sound system specified by FOH sound engineer Steve 'Patto' Pattison, and the realisation of an eye-catching and inventive lighting design created by Steven Douglas. Patto joined the Hozier team mid-way through 2018 shortly after completing the Freedom Child world tour with Irish trio The Script. Hozier’s Nina Cried Power EP dropped almost immediately and with a new (second) studio album anticipated in the spring, the touring schedule started apace and continues worldwide throughout 2019. Patto chose a CODA AiRAY system for the UK and Europe sections, after having an “amazing” experience with it on The Script tour. It is an incredibly powerful and highly versatile speaker system for its compact size, that can be flown or ground stacked in different configurations sounding equally good and bringing a continuity to the wide range of venues on the itinerary. 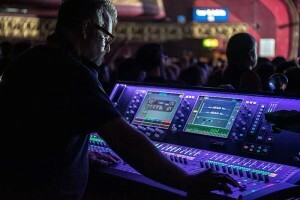 “It sounds great in a 1,200-seat theatre and a 15,000-capacity arena, one box covers all applications,” enthused Patto. The flexibility of going with CODA meant they could use the same box and have the same rich sound with all its luscious detail dealing with the daily variations by using different quantities and rigging set-ups. In the largest format they used 16 boxes per side. For standard stage fills Patto used CODA APS (arrayable point source) speakers sat above the subs to fill out the corners, and HOPS (high output point source) as the lip fills along the front of the stage. They toured both SC2-Fs (dual 15 inch) and SCP-F subs, with two or three of each per side in the standard set up and several variations according to the shape and size of the room. The SC2-Fs were often used when the AiRAY was ground stacked as they provided a solid and secure platform on which to rig the AiRAY cabinets at the correct height as well as reinforcing the low end. These were not always needed in some rooms simply because the low-end response of the AiRAY is so good! Patto is clearly loving mixing the band and with 54 channels of ‘real’ input: eight people on stage who all sing and play instruments and not even a whiff of a backing track coming into his A&H dLive S7000 console! Because it’s all totally live, it’s a sound that he can make really big and spacious yet unique every day. In the set, the song “To Be Alone” starts with a guitar riff and Hozier (Andrew Hozier-Byrne) engaging in a call-and-response routine with the audience. When the drums finally kick in, Patto sneaks in the console’s onboard sub harmonic synth, which has a shock reaction as the audience reel back by the sheer physical impact of it through the CODA hitting them in the chest! Patto has been using the dLive S7000 for the last couple of years, since it was launched, and also mixed The Script with one. (audio for that tour was also supplied by Adlib). He likes it for its adaptability and because he doesn’t need any add-ons. Working alongside him on this leg of the tour were a “fantastic” Adlib crew of Alan Harrison, a veteran of many arena tours who fine-tuned the system each day, and Max Taylor, who took care of all things onstage. 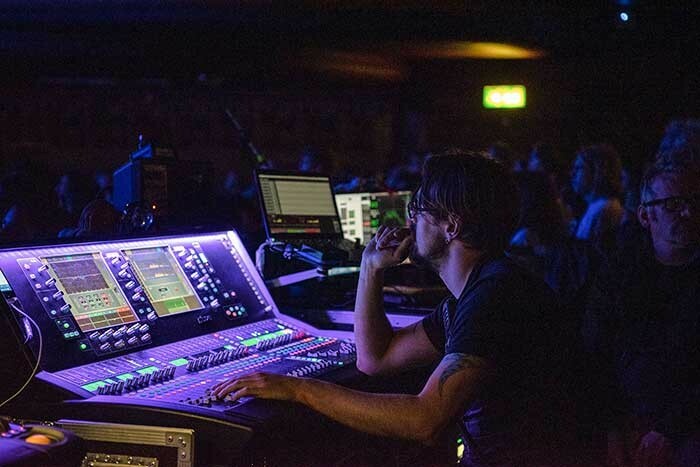 Hozier’s monitor engineer is Darren Dunphy, who used a PM7D console, also free of external plug-ins, and another desk that sounds very good, is highly flexible and offers excellent reverbs. The band were all on IEMs. Adlib supplied a Shure PSM system, with a thumper seat for the drummer, so it was a nice clean stage. Hozier switched from a wired to wireless mic half way through the American leg so he could move around more freely, migrating from a standard Beta 58 to a Shure Axient Digital, which proved to be rock solid. Adlib’s Dave Eldridge took care of all Steven Douglas’s lighting requirements for the UK and Europe. The flown rig was distributed over two trusses (front and rear) and comprised seven Martin MAC Viper Performances and 24 MAC Aura XBs. Another six Viper Performances, three a side, were rigged on two on stage tormentors that were framing the backdrop. On the floor there were six Portman P2 Hexlines on wheeled tank traps, positioned in a row upstage, another eight Viper Performances, 14 GLP X4 Bar 20s and 14 Philips ColorBlaze 48 LED battens. Steve’s concept for this leg of the tour was based around two special scenic drapes which he designed. These took light beautifully and were both illuminated from front and behind creating a real three dimensionality for the stage. 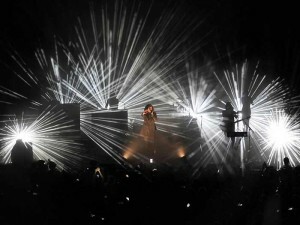 He explained that it was a slightly different touring performance scenario in that the EP was released as the tour started with the album to follow, but the live campaign had to start then, so he produced an interim design that didn’t give away any of the forthcoming album artwork or aesthetics, but does allude to some of it. It can be evolved and developed as the tour progresses after the album launch, and he was keen on having a thread linking the pre and post album phases of the stage presentation. The cloths were made by Perry Scenic and are based on the notion of a dilapidated dwelling. The upstage one has a set of windows with scenic 3D printed window frames. The glass panels in the windows look dirty and grimy, but the drape is actually transparent. One-metre downstage of the window drape is a gauze which looks like it’s fallen there randomly. This acts as a scenic vehicle in its own right and completely conceals the windows until six or seven songs into the set, when the stage space transforms into a different environment. The X4 Bar 20s were used to illuminate the drapes from the front with a row of ColorBlazes in between the two drapes and another one upstage of the back drape, giving Steven three separate layers to shift between. As different areas were lit in combinations, they brought totally different looks to the stage. “I took a very theatrical approach in keeping with the mood and dynamics of the music,” elucidated Steven. In fact, the lights only moved visibly twice during the set, the rest of the movement cues happened during blackouts, it wasn’t an eye-candy sort of show, and there wasn’t a beam light or a strobe in sight! One of the reasons he wanted the Viper Performances was to maximise the animation wheel and evoke the feeling of very subtle and more arbitrary movement, so people were aware but not distracted by the effects. Steven worked alongside an Adlib crew of Kevin Byatt and James Betts-Gray. Previously he’d met Adlib on numerous festivals, the most recent being the 2018 Glasgow TRNSMT, where he was lighting one of his long running clients, The Killers. Client manager Phil Kielty commented: “We do feel very lucky in that we are back working with Hozier again. His live show is hard to beat for pure passion and musicianship and his fans are so loyal. It really does feel like a unique personal experience being at one of his gigs.